These excellent teaching aids integrate the reading of outstanding works of children's literature with important reading-comprehension, speaking, writing, and listening skills. Each 40- to 56-page L-I-T Guide includes learning experiences that provide opportunities for group dynamics as well as activities to challenge students' abilities in critical and creative thinking. 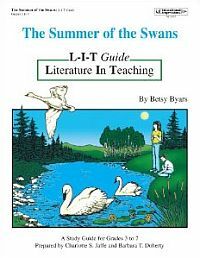 Each L-I-T Guide includes Story Summary, About the Author, Preparing to Read, Cooperative-Learning Projects, Vocabulary Skills, Chapter-by-Chapter Critical-Thinking Questions, Spotlight Literary Skills*, Creative-Thinking Activities, Glossary of Literary Terms, and Post-Reading Activities. *Four or five literary devices and skills are spotlighted in each guide. They include plot, setting, point of view, irony, tone, figures of speech, foreshadowing, symbolism, flashback, cause versus effect, fact versus opinion, main idea, theme, interpretation, and mood.